After cracks were found in during qualification testing on an aluminum actuator arm on an aircraft landing gear, O’Donnell Consulting was requested to perform a metallurgical and engineering evaluation. Chemical, tensile and hardness tests were performed, along with SEM. The scanning electron microscope revealed that the fracture had initiated at one location on the inside diameter surface. 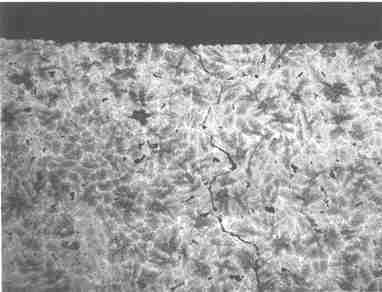 The longitudinal crack in the aluminum tube was found to actually consist of threes separate cracks that had linked together and initiated on the inside diameter surface. 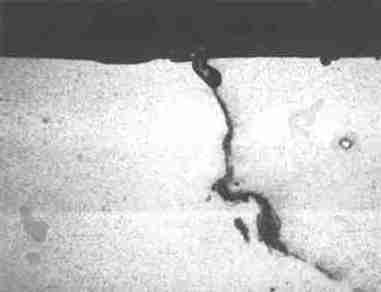 The crack was found to be brittle in nature and no evidence of fatigue was observed. Pit-like flaws were observed on the ID surface of the tube that were found as deep as 0.0013 inches. The pits may be sufficient to produce local cracking at the very low end of the fracture distribution curve. We recommended finite element analysis as well as fracture mechanics analysis to verify. By quantifying the size of the elongated pits which are significant to the cracking problem, the machining processes can be modified and/or heat treatment to eliminate the problem. The images above show the ID surface at 200x and 1000x.